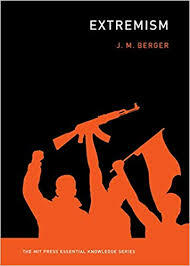 Extremism, by J. M. Berger (Cambridge, MA: The MIT Press, 2018, ISBN 9780262535878). x+201 pp. Softcover, $15.95. Extremism is part of the MIT Press Essential Knowledge series, consisting of short expert overviews of subjects of current interest. The accusation of extremism appears often and, like terrorism, is too often one of those very elastic words that means little aside from an expression of disapproval. Berger attempts to rescue the label and turn it into a reasonably precise term. He succeeds, although the book should have been even shorter than the pocket-sized two hundred pages at which it stands. For Berger, extremism starts with a hard distinction between an ingroup and an outgroup, with further refinements such as perceptions about who might be eligible to join the ingroup. But going much further than the common human tendency to form tribes, “extremism refers to the belief that an in-group’s success or survival can never be separated from the need for hostile action against an out-group” (44). Extremism, therefore, if not always explicitly violent, appears perpetually poised on the verge of violence against an outgroup identified as a threat. Furthermore, the enemy status of the outgroup has to be conceived of as unconditional and non-negotiable. Much of human violence, even when perpetrated in the name of tightly-knit identity groups, is not associated with extremism.